Support Bank Basic is the ideal contract for Individuals who want the ability to get IT support as and when they need it, safe in the knowledge that the service has been paid for. Support Bank Basic is available for just £40 an hour (4 hours minimum purchase required at the start of the contract) and the time is then available for you to use when you want, how you want and on what. Once the time has been used up it is then up to you if you wish to buy more time or not - you are not tied to any lengthy contract nor required to renew. One of the many advantages of signing up to a Support Bank contract is the ability to have your issue diagnosed and often fixed remotely, saving you the cost of an on site visit. Plus, as support contract customers are billed to the nearest 15 minutes (rather than 30 minutes with Pay As You Go), you will almost certainly save money on each call you make. 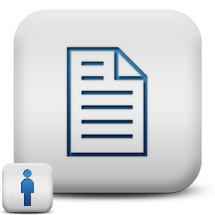 You may want to check out Support Bank for Home and Support Bank for Business as well. 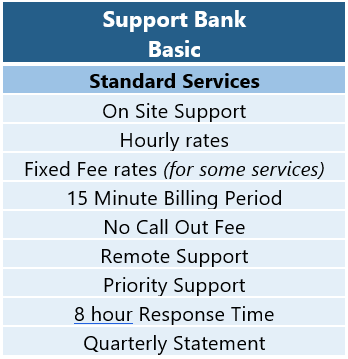 All Support Bank Standard services can be supplemented by Add On Services, which enable you to outsource more of your IT headaches but on a manageable, and cost-effective, monthly basis.